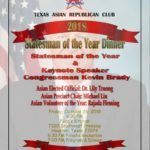 The Texas Asian Republican Club (TARC) invites you to the 2018 Stateman of the Year Dinner on October 26, 2018. Our Stateman of the Year and keynote speaker is U.S. 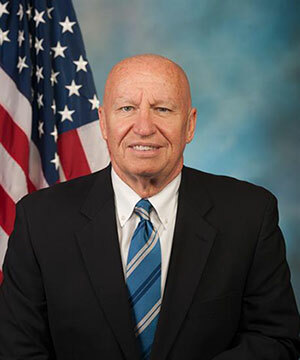 Congressman Kevin Brady. 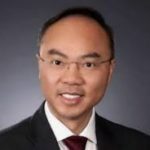 Our Asian Elected Official of the Year is Dr. Lily Truong, Alief ISD Board of Trustees Position 1. Table and Ad Sponsorship information are enclosed. We look forward to having you help make it a special and memorable evening. 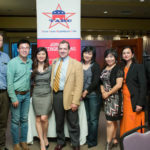 The Texas Asian Republican Club was founded in 1985 and is celebrating its 32nd anniversary this year. 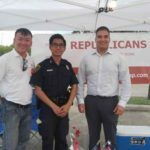 We are the leading conservative voice of the Asian American population in the Houston and Sugar Land metropolitan area. 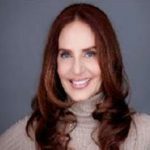 We represent a cross section of different ethnic, linguistic, and religious backgrounds across the multiculturally diverse Harris County and Fort Bend County. Together we are united in our belief in Republican ideals such as freedom, limited government, and fiscal responsibility. The American Dream is what brought us and our families to this country. We will fight with our conservative leaders to preserve this opportunity for future generations. 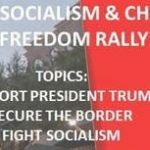 Be a part of the movement and participate in building a better future for our country! Join us and stand up for the values that make our country great. Make a difference.